To prepare for my first post as a TKZ member (yay! ), I read all the social media posts on the Kill Zone (my little research addiction rearing its head :-)). Back as far as 2009, Joe Moore wrote Social Networking Showdown, which explored MySpace vs. Facebook, Shelfari vs. Goodreads, Crimespace, Gather, Bebo, LinkedIn, and the all-important email list. Even though some of these sites are nonexistent today, Joe’s advice still applies. And in 2011, he shared his perspective on using manners online. Which is critical these days. The way we conduct ourselves on social media matters. Hence, why Jim made social media easy and why, I presume, Jodie Renner invited Anne Allen to give us 15 Do’s and Don’ts of social media as only Anne could, with her fantastic wit. One year later, in 2016, Clare shared what’s acceptable for authors on social media and what isn’t. Jim showed us the dangers of social media, and how it can consume us if we’re not careful. Through the years the Kill Zone authors have tried to keep us from falling into the honey trap of social media. Which brings me to the burning question Kathryn posed this past June: Writers on Social Media: Does it Even Make a Difference? In my opinion, the correct answer is yes. Working writers in the digital age need to have a social media presence. Fans expect to find a way to connect with their favorite author. How many of you have finished reading a thriller that blew you away, and immediately went online to find out more about the author? I know I have. It’s only natural to become curious about the authors whose books we love. Give your fans a way to find you — the first step in building an audience. I’ve seen authors who don’t even have a website, never mind an updated blog. This is a huge mistake, IMO. It’s imperative to have a home base. Without one, we’re limiting our ability to grow. There are two types of blogging: those who blog about their daily routine and those who offer valuable content. Although both ways technically “engage” our audience, the latter is a more effective way to build and nurture a fan base. When I first started blogging I had no idea what to do. I got in contact with a web design company (just like web design company Nashville) to help me get set up, and away I went! I’ve always loved to research, so I used my blog as a way to share the interesting tidbits I’d learned along the way. For me, it was a no-brainer. I’d already done the research. Writing about what I’d learned helped me to remember what I needed for my WIP while offering valuable content to writers who despise research (Gasp!). Over time my Murder Blog grew into a crime resource blog. Running a resource blog has its advantages and disadvantages. Be sure to look into the pros and cons before choosing this route. When I first scored a publishing deal, I realized most of my audience was made up of other writers. The question then became, how could I attract non-writers without losing what I’d built? My solution was to widen my scope to things readers would also enjoy, like flash fiction and true crime stories. Who doesn’t like a good mystery? With a resource blog it’s also difficult to support the writing community. Book promos go over about as well as a two-ton elephant on a rubber raft. If you decide to run a resource blog, find another way to support your fellow writers. When one of us succeeds, the literary angels rejoice. There’s one exception to the “no book promos” rule for resource blogs, and that is research. It’s always fun to read about other writers’ experiences. Subtly place their book covers somewhere in post (with buy link). 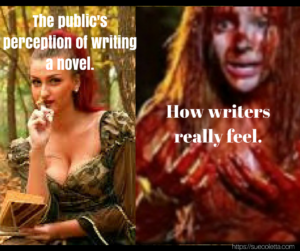 That way it benefits both your audience and the author. The one thing we can count on is that how-to blog changes with the times. A few months ago, my publisher shared a link to an article about blogging in 2018. Because she shared the article via our private group, I’m reluctant to share the link. The gist of article is, come 2018 bloggers who don’t offer some sort of video content will be left in the dust. Only time will tell if this advice holds true, but it makes sense. The younger generation loves YouTube. By adding a video series or a Facebook Live event we could expand our audience. It’s time-consuming to create each video episode. Hence why I had several months in between the first two episodes of Serial Killer Corner. Our first priority must be writing that next book. However, consistency is key. Weekly, monthly, bi-monthly? Choose a plan that works for you and stick with it. There are many internet marketing experts who can help make your blog become successful. SEO — Search Engine Optimization — drives traffic to your website/blog. Without making this post 10K words long, I’m sharing a few SEO tips with added tips to expand our reach. In the future I could devote an entire post to how to maximize SEO. Would that interest you? every post should have at least one inbound link and two outbound links; we highly recommend speaking to a digital marketing agency such as OutreachPete.com to get guidance on how to build these links. Most of us are familiar with the 80/20 rule. 80% non-book-related content; 20% books. My average leans more toward 90/10, but that may be a personal preference. What should we share 80% of the time? The easiest thing to do is to share what we’re passionate about. When I say post about passion I don’t mean writing. Sure, we’re all passionate about writing, but I’m sure that’s not the only thing you’re passionate about. How about animals, nature, cooking, gardening, or sports? One of the best examples of sharing one’s passion comes from a writer pal of mine, Diana Cosby, who loves photography. Every Saturday on Facebook, she holds the Mad Bird Competition. During the week she takes photos of birds who have a penetrating glare and/or fighting stance. On Saturdays, she posts two side-by-side photos and asks her audience to vote for their favorite “mad bird.” Much like boxing, the champion from that round goes up against a new bird the following week. I regret to inform you that though your ‘fierce look’ holds merit, it far from meets the requirements for entry into the Mad Bird Competition. Please practice your mad looks and resubmit. It’s a blast! I look forward to these posts every week. As such, I’m curious about her books. See how that works? My own social media tends to run a bit darker … murder & serial killers top the list, but I also share stories about Poe & Edgar, my pet crows who live free, as well as my love for nature and anything with fur or feathers. The key is to be real. Don’t try to fake being genuine. People see right through a false facade. Also, please don’t rant about book reviews, rejection letters, or anything else. Social media is not the place to share your frustrations. As for soft marketing on social media, I like to make my own memes. It only takes a few minutes and it’s a great way to keep your fans updated on what you’re working on. In the following example I wrote: #amwriting Book 3, Grafton Series. I also linked to the series. Don’t forget to include a link to your website. The more the meme is shared, the more people see your name. Keep it small and unobtrusive. See mine in the lower-right corner? In the next example, I asked, “What’s everyone doing this weekend? No words, only gifs.” Have fun on social media. The point is to engage your audience. Folks love to be included. Plus, I genuinely want to get to know the people who follow/friend me. Don’t you? It doesn’t take much effort to make your fans feel special. Take a few moments to mingle with them. It’s five or ten minutes out of your busy schedule, yet it may be the only thing that brightens someone’s day. In a world with so much negatively and hatred, be better, be more than, be the best person you can be … in life and on social media. Over to you TKZers. How do you approach social media? Would you be interested in more SEO and blogging tips? 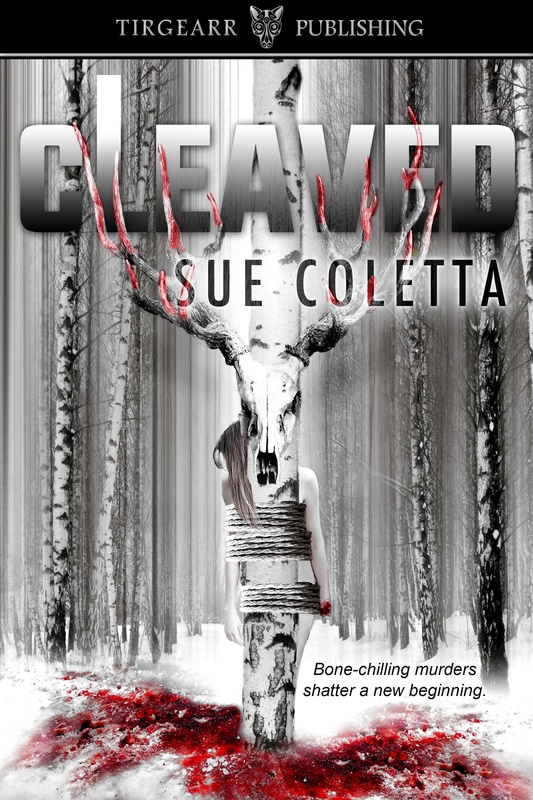 CLEAVED, Grafton County Series, Book 2, is on sale for $2.99. This entry was posted in #writers, blogging, SEO tips, social media and tagged #amwriting, #writetip, Blogging, SEO tips, social media, soft marketing, Sue Coletta, writers by Sue Coletta. Bookmark the permalink. Wow, Sue, you hit it out of the park with your first “official” post. What a lot of helpful information. Social media is intimidating and overwhelming to us old dogs who learned to type on manual Underwoods while listening to “I Want to Hold Your Hand” on our transistor radios. Thank you for such a comprehensive list of suggestions. Definitely bookmarking this. Yes, please do an expanded post on SEO. You mention creating memes. Can you write how-to-do-it a post on them? Great info and looking forward to more! Thank you, Debbie! You are not alone. I’ve helped numerous “old dogs” with social media, and I know it can be intimidating. Adjusting, especially when it’s out of our comfort-zone, is never easy. Absolutely. I’d love to do an expanded post on SEO. It’s so important, especially when it takes hours to write a good blog post. We may as well optimize it so it keeps driving traffic to our site. I’d be happy to include how-to make memes. One of the easiest sites to use is http://www.canva.com. I use canva for my memes. Takes a little trial and error, but once you figure out how everything works, it’s an easy way to create all sorts of images. Much easier than Photoshop. Photoshop is a nightmare! I wouldn’t refer my worst enemy to them. My web guru recently installed Yoast on my site. I must say, it’s a double-edged sword, as they “grade” your posts and being an over-achiever, I now spend time trying to get those green lights so it takes me longer to get a post ready to go. Whether it’s really helping? I don’t know. The whole reason my guru installed it was so I could control the images that showed up on Facebook. ** I wish more people would follow the 80/20 or 90/10 rule. Agreed, Terry! When I first installed Yoast I did the same thing. Once you get used to it, you’ll love it. Often times those lights don’t change to green until after the post goes live. It took me a while to figure that out. I did pack a lot of information into this post. Best to chip away at it, as you’ve said. I wish more people would follow the 80/20 or 90/10 rule too! Welcome to the Zone, Sue. Glad to have you with us! And, of course, this is “the law” — Our first priority must be writing that next book. Thanks, Jim! Now that this post is done, I need to follow “the law” myself. Have an amazing day! WOW! Your first post was information packed. I admit, a lot of stuff I didn’t even understand, especially once I got to the SEO section. For example, in my brain, I think all links are outbound, since when you click on them they take you somewhere else. Also need to learn about ‘pingbacks’ and the whole ‘stop words/post slug/permalink’ stuff. But that’s good. It gives me homework. 😎 Thanks for the specific tips. Inbound links are links that point to your own previous blog posts. Outbound links take you to a different website. Pingbacks, aka trackbacks, is simply sending your post link to blogs with bigger audiences. In WordPress, if you link to another WordPress blog, pingbacks are sent automatically. If you link to, say, Blogger, then you need to do it manually, but it’s only a matter of pasting the link into the section that says “Send pingback.” Easy. Stop words are: and, a, the, and the like. Any word that doesn’t convey what the post is about should be delete, except how-to. How-to posts are hugely popular, so I keep those two stop words. SEO can be confusing. I’ll write a post about it. There seems to be differences of opinion on where links should go. A very informal “poll” said most people want them to open in a new tab so they don’t “lose” where they were to begin with, and I’m one of these. That way, your page is always open. My computer programmer crit partner says that’s wrong, but since I never remember I can ‘right click’, I’d rather have people get new tabs if they click a link on my blog. Your take? I’m with you, Terry. Posts should always open in a new tab. It makes no sense to take visitors away from our original post. I’m surprised anyone would advise otherwise. When in doubt, do what YOU think is best. Yeah, I hate being taken away from the page I was originally on. GRRR!!!!! Thank you for sharing the wonderful tips on social media tips. Very helpful, and my humble thanks for the mention. I approach social media with the intent of sharing my passions and interacting with my readers in a positive and fun manner. It’s is a wonderful way of getting to know them, and for their getting to know me. Diana Cosby, AGC( AW) USN, Ret. My pleasure, Diana! Thank you for the laughs every week. As you know, I love the Mad Bird Competition. Genius idea. Wow. Tons of meaty stuff to partake in, Sue . Welcome to TKZ. I’m so excited you are a member. Thanks for such a great post!! 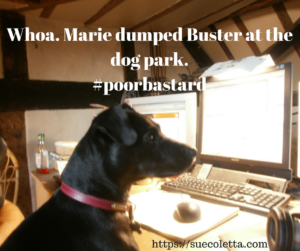 Wonderful debut article Sue…think I might hire you to do my SEO! Great debut post, Sue! So much content, and all quality ideas. Kudos! Great Job! Welcome to TKZ Blog. Thank you, Lynne! I think my breathing is beginning to normalize finally. Hahahaha. Thank you for these practical and doable tips, and for your subsequent definitions of some of the SEO terminology you used. I’m going to save your post and tackle those SEO tips one at a time, as a previous reader suggested. Wonderful! I’m so glad you found the post useful, Rick. Any questions, just holler. For me, the most intimidating aspect of social media is thinking of something to say every day. I don’t own a dog or a cat, and my kid is grown, so I don’t have cute stuff to post. I have a YouTube channel called “A Writer’s View of Writing and Publishing” that gets a fair amount of traffic (mostly through Facebook), but that, like my work here at TKZ, is geared toward other writers. My primary social media platform is Facebook — as I said, that’s even the primary outlet for my videos. I treat my author page differently than I treat my timeline, the latter being limited to people whom I consider to be friends in the real world. On my author page, I focus almost exclusively on book events. Is this a mistake? Should my author page offer a look into my personal life? Is that a place for vacation pix? I understand your frustration. Social media can be intimidating. Your author page should be used to promote John, the author. So, you should focus on your books there. Your video series is also perfect. Although, starting very soon, Facebook will stop showing professional pages in the main feed. The reason, of course, is money. They want us to pay to boost posts. Which means your personal Facebook will become more important than ever. For what to show 80%- 90% of the time, you don’t need a pet. Share about things you like to do. You could take pics of nature walks, boating, golfing, or whatever it is you do for fun. One of the things I do is shoot video of research trips, like going to a desolate swamp. Folks love that stuff. But you don’t even need to make it that difficult. Tell folks what you plan to do on the weekend (something fun), and ask what they’re doing. Talk about a movie you watched, or a book you read. Think of social media like a cocktail party. Small talk leads to more in-depth conversations. Great information, Sue and so glad you’re here at TKZ! Look forward to more posts. Thank you, Patricia! I’m thrilled to have joined the team. I guess the most effective way to reach readers/fanbase on social media these days is to have a YouTube channel. I think it’s much more effective than blogging, given that “readers (fans)” don’t have to sit down and read a thousand/two thousand word article. They just sit back on the couch with a cup of coffee and spend ten minutes watching their favourite author talk about … whatever. Having eye contact with your fans doesn’t hurt either, any salesman will tell you that is very important if you want to instill trust and sell a product. Besides if you just wing it and record a ten minute presentation for your YouTube channel, you won’t have to sit down afterwards and revise and edit, which can be very time consuming. Anyway that’s my five cents on the subject. Hey, Hervey. It depends on your audience. I took a poll on my website regarding video vs. post. Written post was the clear winner. The majority even suggested I include the transcript when I “vlogged” (video blogging) so if they were short on time they could read instead. It always comes back to knowing your audience. I just passed the two year anniversary of my website. My website is a newspaper about and for the faux people who live in my fictional town. Since in reality the postings are all fictional short stories I really have no idea how to ‘SEO’ them – it is not like someone is searching for Krystal Karat in Rosemeade, SC, neither the store or the town exist. Do you have any suggestion as to what I could do? Thank you for explaining the stop words. I read an article recently that made no sense. The author said to remove stop words from the title, what the author forgot to include was FROM THE ADDRESS. Many of my titles have stop words – should I go back and take them out of the slug? If so will I have to go back and change all my internal links or should they adjust on their own? I have noticed in google searches it will say something like POST ABOUT RABBITS – THE RABBIT HUTCH.THE RABBIT HUTCH is the website it is on. Should we add the name of our website by the title for searches, and if so how does one do that without the name appearing like that on the post itself? Is there a setting for that? Can one get pingbacks if they aren’t on WordPress.com or blogger? My son keeps telling me to get on YouTube, but I am not sure what I want to video about. I guess it’s time to come up with something. Thank you so much. Please come visit, something is always going on in New Grace. Michelle, I wrote you a long, involved comment and it disappeared into the ether. Ugh! To my knowledge, all blogging platforms allow you to send and receive pingbacks, not just WordPress and Blogger. You don’t need to go back and change all your slugs, Michelle. With two years of blogging under your belt, it’d be way too time-consuming. Better to spend that time writing. 😉 In future posts, however, now you know to delete the stop words from the slug. Optimizing SEO when posting fictional stories isn’t easy. I’ve seen authors who use a character’s name, setting, theme, etc., and you can certainly do that once or twice. You won’t want to keep using the same keyword or you’ll wind up competing against your previous posts. If you choose setting, use NC rather than your fictional town. Remember, our goal is having the post appear on the 1st page of Google when someone searches for our keyword. More people will search for North Carolina. An easier way is using the genre as the keyword. You’d also have to include it in the title. Example: Heart-thumping Thriller: [story title here] Be mindful of the way you convey your genre. I’m sure there’s a gazillion “heart-thumping thrillers.” So, instead, try to come up with creative ways to represent your genre. Go to Google and search for prospective keywords and phrases. It’ll give you an idea of the most popular keywords (short-tail) vs. the keywords that are more apt to land you on the 1st page (long-tail). Each time you search for a keyword Google will show you how many articles they list i.e. 1,998,788 = short-tail. Ideally, you’d like to stay around 500-800K (short-tail). You’ll need to play with this in order to nail the right one. You don’t need to manually add the site name to your slug. In settings, you should see a toggle-switch or check-box that says “include site title in posts” or a variation thereof. Switch it on, and the site title will ride after the post title when shared on social media. For example, my site title is Crime Writer Sue Coletta. Every post when shared reads “[post title] – Crime Writer Sue Coletta.” Each time it’s shared, my name reaches a wider audience. Highly recommend taking advantage of this feature. Sue, I’m confused by what you mean by “create your own meme.” As I understand the term, it’s not something you just “create” by posting a picture on your website. True, Eric. However, on social media a meme is slang for a photo with words that conveys an emotion. Many times they’re humorous, but you can also take a snippet from the book you’re marketing, add a background that conveys the emotion of the scene, and include your book cover, much like you’d create for a Facebook ad. Sory – I know I asked a lot of questions in my comment – but just one more. I understand it is a pic, but how does one add a link to the picture? I’m on Pinterest, Linkedin, Goggle+, faceboook and my site. No, no, it’s fine, Michelle. Ask away. Adding a link is easy with http://www.canva.com or http://www.picmonkey.com (my two favorites). Upload your pic –> click “add text” –> choose your font style and type size –> add your link –> save and download. Voila! Thanks. Picmonkey no longer lets you save your work on your computer – so over to CANVA I go. Yes, in order to take advantage of some of the features, you have to become a member. I was trying to think how you might put the picture on one site (e.g., New Grace) and then link to it from your other presences, but then it struck me that maybe the thing to do is to post it on all four of your places. Different people will be visiting different of those places, I think, and if it’s there they won’t have to click to go somewhere else. At least that’s a thought. Don’t know what others would recommend. Didn’t see your answer, Sue, before I posted mine. Need to alway refresh before I post. I think I just sent you an email at your website. Please check. It was to me. It’s easy on this site to get confused about where one is on a thread. Great post, Sue. You amaze me with all you’ve accomplished this year. This rocks, Sue – a great post. Thanks for sharing your knowledge! Thanks, Rachel! I hope your seminar was a smashing success!